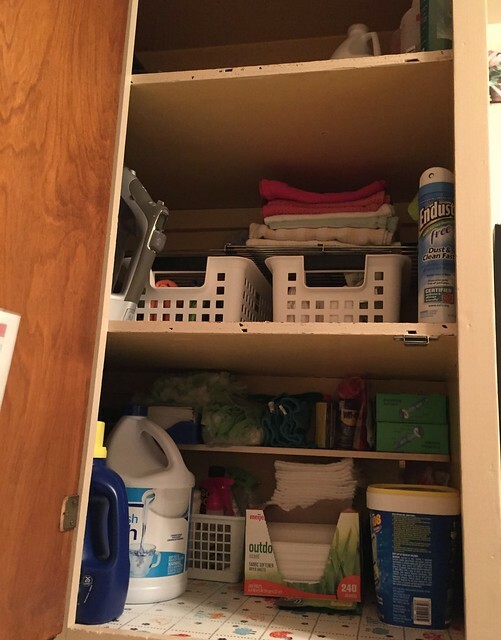 Believe it or not, after over 8 years of blogging about cleaning and organizing my home, I’ve never dedicated a post to how or where I store my cleaning products! I suppose part of the reason for this is because I really don’t have all that many cleaning products — I use sanitizing wipes, vinegar spray, and microfiber clothes to clean the majority of my house… so there’s just not much to store. Well, ugly impractical laundry room aside, today is the day I’m finally sharing where I store my various cleaning products! 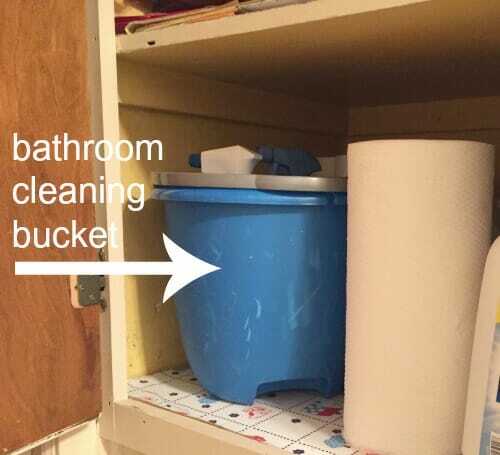 Several years ago, I shared my bathroom cleaning bucket — and this is basically the same system I use today. I keep this bucket in the laundry room cabinet and carry it around to each of the 3 bathrooms whenever I’m ready to clean them. We also have a can of sanitizing wipes in each bathroom. I use these to quickly wipe down door knobs, faucets, counters, toilet seats, and floors in between cleanings. 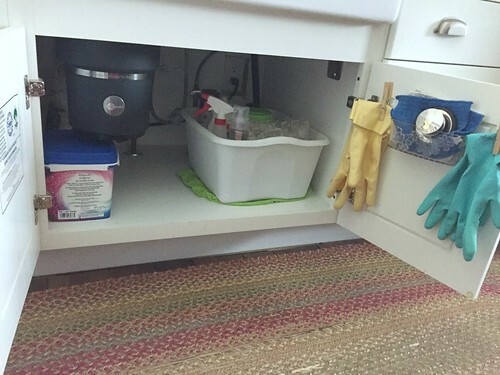 I have a small tub under the kitchen sink for dish soap, vinegar spray, sanitizing wipes, a few sponges, the oil for our butcher block counters, dishwasher tabs, a rubber mat for our sink, and the oven cleaner I use on occasion. I can simply pull out this tub whenever I need to wash dishes or clean anything in the kitchen and I’m good to go. It’s all in the very awkward cabinets in our laundry room. I’d show you a picture, but they are so awkward to access as they are mounted against the wall, next to the door (sort of kitty-corner from the washer and dryer). Plus, there is a counter top in front of them, so you can’t even stand in front of them to take a picture (or access the contents inside). I cannot wait to redo this tiny space and make it more functional! I rarely ever “stock up” on cleaning supplies — mainly because I don’t like storing so much extra, but also because I use vinegar and baking soda a lot, so I can just make more whenever I need it. As I mentioned above, we’re hoping that this summer will finally be the summer we get around to renovating our last bathroom (the one right off the kitchen) and the laundry room (also right off the kitchen). In the meantime, I’d encourage you to go through your cleaning supplies, purge the ones you no longer use, consolidate, simplify, store them in convenient places, and then USE THEM! 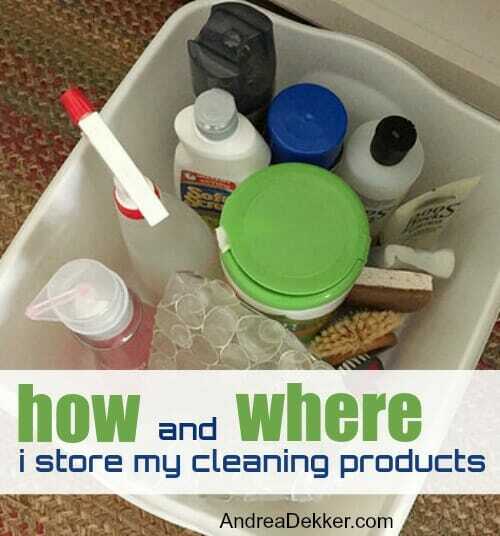 Where do you store your cleaning supplies? I was looking through your pictures and thinking I would love to see a post on….vacuum cleaners! Ha! I’ve always been a firm canister girl, but my husband wants an upright. My only experience with uprights were some cheap brands years ago and I wasn’t impressed with stair cleaning and the attachments. So…I’d love to hear your perspective as we will likely be vacuum shopping again within a few months. 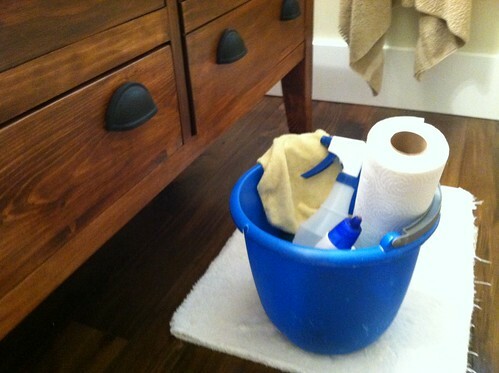 I super simplified my cleaning routines and products after I had surgery on a shoulder. Doc told me no lifting anything heavier than a coffee cup. So in both of our bathrooms, I have a Rubbermaid type sweater box without a lid stored in the middle of the vanity under the sink. Both bathrooms are identical. Each has small wastebasket on left and sweater box on right. 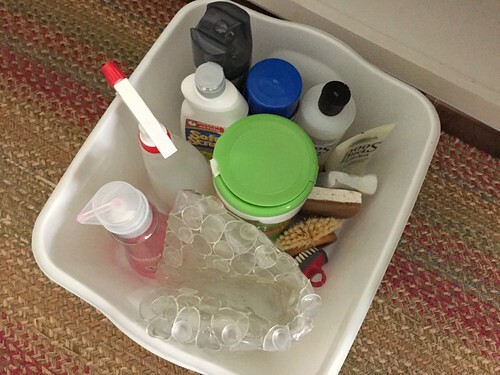 In the box are 4 simple items: toilet swab in an old cottage cheese tub, Lysol bowl cleaner, Clorox wipes and spray bottle of invisible glass window cleaner. Mounted on the door is a paper towel holder. My bath cleaning routine takes under 5 min to swab bowl, wipe sink and bowl rim, spritz and wipe mirror, and wipe the counter. It’s simple because I don’t decorate my counters with hair and makeup products. I have simply a liquid soap bottle and a candle. That’s all. Toilet tops have a cube box of tissue. Kitchen has nearly same setup. 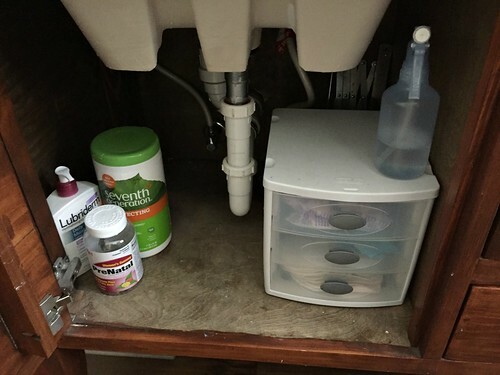 Paper towels on the counter, but under is a tray attached to the door that holds a sponge, a stopper for garbage disposal, and a very small squared corner plastic container that holds 12 Finish dishwasher tabs or pods — rectangular ones with red dot in center. Then there is the ubiquitous sweater box again. It has Comet for my easily stained 30 yr old white sink, Barkeepers for my cookware (we have 100% Teflon free house) a bottle of Dawn – the average easy to squeeze size. I tried that huge Costco one and hated it, as much as I hate refilling the smaller one because I spill it everywhere, but I do refill and cuss a fair amount. There’s a tub of wipes, and a couple other things under there as well. I use a Clorox kitchen spray for cleaning up meat contamination in and around the sink — usually after a session of cutting up chickens or slicing a tenderloin into steaks after a Costco run. Mostly that’s in the garage. The only other thing I keep in my sweater box is some Invisible Glass for the over sink window that gets cleaned of splatters from washing up. I never have to leave the room for basic daily maintenance of the baths or the kitchen. I pretty much clean everything in the kitchen with hot soapy water. Worked for my mom and my grandma back when there were two cleaning products in their kitchen! Ivory soap for dishes and bon ami to scrub. My grandmother washed dishes with ivory bar soap! What other cleaner would you recommend that would work like vinegar? I tried to use it, and my husband couldn’t stand the smell. I don’t have a lot of cleaners but would like more “natural” cleaners. good question — i actually reviewed a product that might be perfect for you (vinegar without the smell)! Where do you store your garbage bags? I have several sizes. For the trash in the kitchen I buy the warehouse sized box at Sam’s Club or Costco which has the two giant rolls inside. The rolls are awkward to handle and take up so much room in the cabinet. 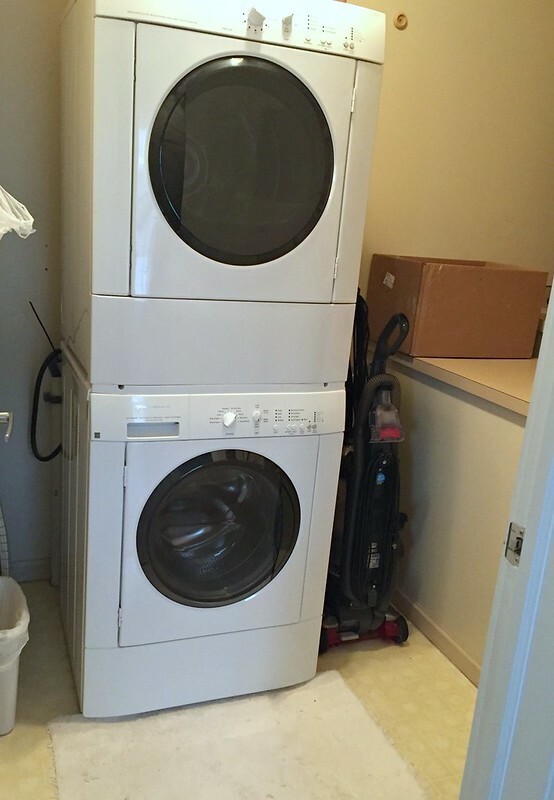 I can’t wait to see the laundry room makeover. I, too, have front loaders, but mine are side by side. I don’t want to spend the money on the pedestals due to how expensive they are. However, I often have to sit on the floor in front of the washer or dryer to load and unload them. It’s quite a stretch, sometimes, reaching into the back of them to retrieve laundry. An idea I had was to have some pedestals custom made which would have space to store laundry baskets. Gotta find me a guy like Clint on Fixer Upper. Our garbage bags are stored right behind our kitchen garbage can (which is right next to the sink). We only have the 1 size, so it’s easy. We just use plastic grocery bags for our smaller bathroom trashcans and I have a bag of those in the laundry room with the other cleaning supplies. Also, I really miss having a side-by-side washer and dryer. I’m not positive what we’re planning to do yet, but I am interested in the idea of custom-making a platform for my washer and dryer to sit on — something that would provide lots of storage underneath. We’ll see what we come up with! I agree with allllllll of this! Keeping it simple and using more natural ingredients, like vinegar and baking soda. When I clean my oven I even do a paste of baking soda, water and dishsoap. Paint it on and leave it overnight and then just wipe it out. Works great & looks like new! Just did this yesterday and put in a new oven liner. Brilliant idea those things! So, how are your dishgloves hanging on clothespins on the cabinet? Are they glued or just clipped right to the basket stuck there? Thanks. yes, we LOOOOOVE the oven liners! As for the dishwashing gloves, I just stuck the clothes pins to the cabinet with 2-sided sticky tape. They haven’t budged in over 5 years! yes they are fabric softener sheets. I don’t use them all that often, so I have a feeling this box will be around for a while! 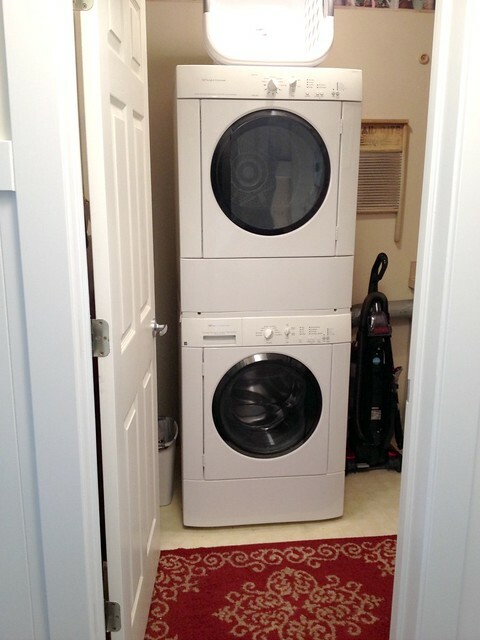 At least your laundry room is on the main floor! That’s a real plus, in my opinion. Amen…it’s 39 in my garage in my San Francisco Bay Area home. It’s miserable out there. Trying to use cold water to save on natural gas but it take three times as long to dry now. Next house will have indoor laundry or I won’t move in! oh wow — we obviously wouldn’t be able to have water in our unheated garage as it would freeze during the winter, but I’m certainly glad my laundry room is inside!